Gary C. Hatcher studied ceramics at The University of North Texas where he received a Bachelor of Fine Arts degree in ceramics and at Texas A&M at Commerce where he received a Master of Fine Arts degree in sculpture. He apprenticed in ceramic art studios in Devon, England, with Michael Leach and David Leach from 1976 to 1979 as well as shorter apprenticeship experiences in France and Greece. He is currently Professor and Chair in the Department of Art and Art History at The University of Texas at Tyler where he has taught since 1992. After returning from England in 1979 he has maintained a studio in east Texas with his wife, Daphne Roehr Hatcher, also a ceramic artist, firing most works in a Bourry box wood fired kiln. He continues to balance teaching, administration and a very active involvement in the creation of ceramic works at his studio. He has had articles published in Ceramics Art and Perception, Ceramics Technical, Ceramics Monthly, The Studio Potter and American Craft. His works have been included in over a dozen books in print. He exhibits widely both nationally and internationally. 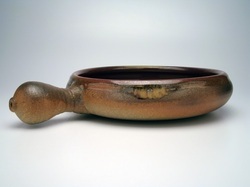 Major exhibitions of his ceramic works have been held in venues such as Baylor University, Houston Center for Contemporary Crafts, Austin College, Tyler Museum of Art and Irving Arts Center. His works are in numerous private and museum collections. Hatcher has curated a number of exhibitions of ceramic works for The University of Texas at Tyler and the Tyler Museum of Art. My ceramic work is glazed and wood fired. I am interested in the subtle accumulation of light wood ash on glazed and unglazed surfaces and the accentuation of pure form. Color in my work is enhanced by wood firing, not dominated by wood ash deposits. Clay provides a perceptual and tactile journey with natural materials as well as a conceptual and philosophical challenge of the mind. That philosophical challenge continually requires balance of mind, hand and eye and is compelling without end. Making clay vessels is my philosophical journey, always compelling, endless in variation and mystery.